For the past few weeks I’ve been sharing ideas for to get mom organized and prepared for the new school year, from meal planning to scheduling activities, time management, and more! But what about the kids? Do you have a teen, tween, or preteen who needs a little help in the organizing department? Do they need a little nudge when it comes to remembering tests, assignments, or other important items for school? Today I have a few organizational tips that I’ve found helpful as a student and that I’m trying to pass on to our teen son. 1. 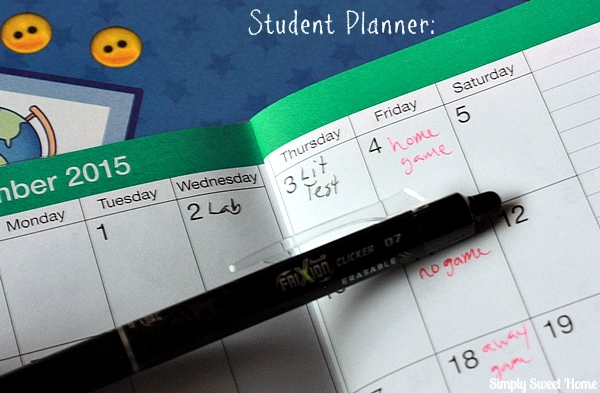 Student Planner – I think the most obvious way to stay organized is with a student planner. I like a planner that contains a monthly calendar (as shown above) followed by additional pages for you to write in your details for the week. A student planner is a great place where you teen can write down tests, projects, and important assignments, but also write down other important events and school activities. 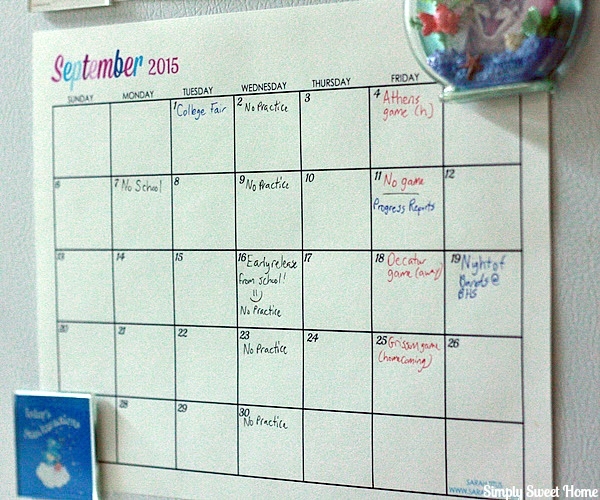 The events on the calendar above were written using Pilot’s FriXion Clicker erasable gel ink pens. 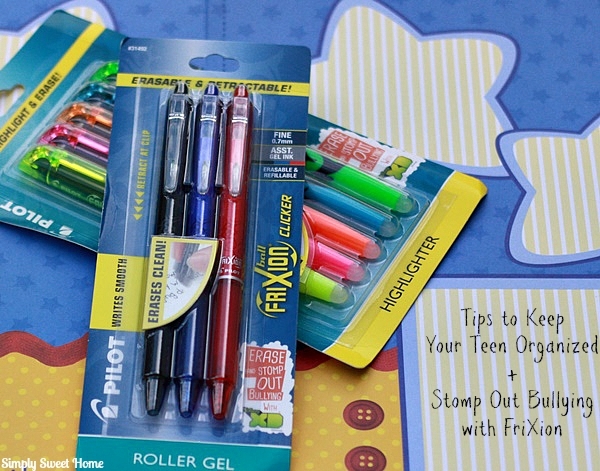 You can find Pilot® FriXion Erasable Pens in the school and office supply section at Target. 2. 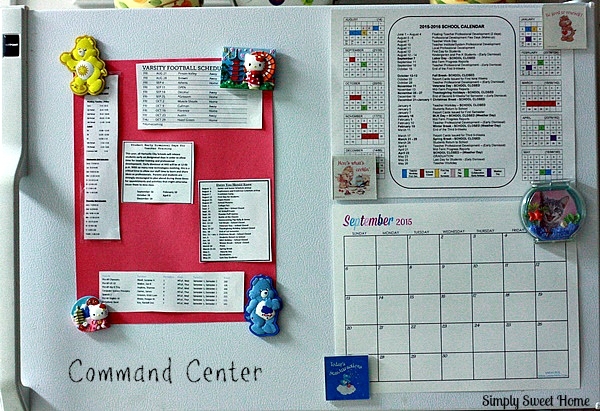 Command Center – I also like to keep calendars and important notes posted at home. I do this mostly for myself, so I can find an important date on a moments notice, but it’s also a good thing to have for your teen. If he has any questions about the football schedule, report cards, and those oh-so-important vacation days, he can just look at what’s posted on the command center. 3. Binders/Notebooks for Each Class + One – At our high school, each teacher has her own supply list. Most of them require a three-ring binder. We make sure our son has all his supplies, and I try to encourage him to put any handouts and assignments he has INSIDE the proper notebook before he leaves class (not inside his backpack or another notebook). 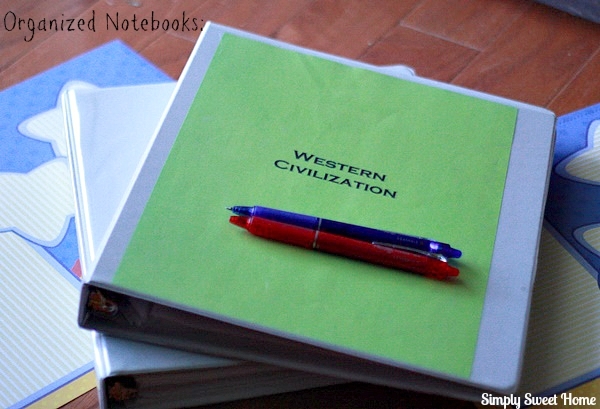 In addition to the notebooks each teacher requires, I also recommend having an additional notebook/folder. This is a good place to keep important papers that don’t have to do with an actual class (items student picture forms, report cards, and other important parent letters), and it good place to keep extra loose leaf paper. And don’t forget to label the outside of the binders. This makes for a quick and easy grab at the lockers and in class! 4. Routine Maintenance – One day Noah asked if I could help him get organized, and I told him I could help him, but he’d have to “maintain” the organization! Maintenance is the key to organizing. Binders could be cleaned out every couple of weeks: Good papers that are piling up in binder pockets should be hole punched and placed in the proper binder, and papers that are no good should be trashed. The same thing should be done about once a month (or as needed) with backpacks and lockers. 5. Use technology. Our son loves his computer and mobile devices, so I think technology is the best organizational tool we have on hand! I’ve encouraged him to put important dates on the calendar in his phone and set it up so that he gets some kind of alert when the important assignment or event is drawing near. In addition to getting some great pens to write with, I’m happy to report by purchasing Pilot FriXion pens you can help to stomp out bullying! Pilot is partnering with the Stomp Out Bullying Program, a national bullying and cyberbullying prevention organization. The organization designs awareness and education programs designed to ‘erase’ negative bullying behaviors and ‘rewrite’ positive, productive solutions. As if that’s not a good enough reason to toss these pens in your shopping cart full of school supplies, Target has a great deal for you! 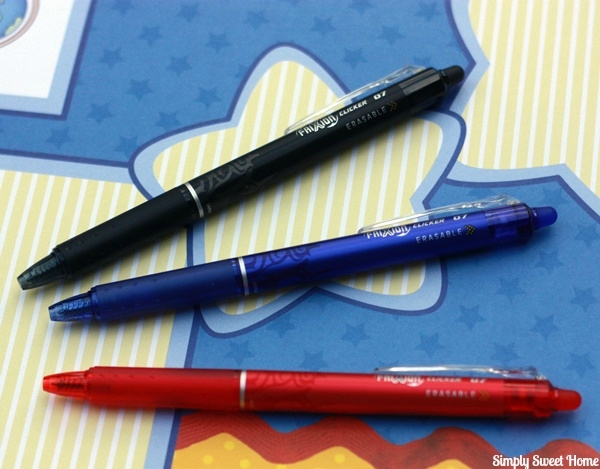 Starting August 23 through August 29, you can save 20% FriXion Clicker pen 3pk Assorted and FriXion Clicker pen 3pk Black. Check your local Target circular for more details! Is your teen well-organized? Are they a messy bessy? 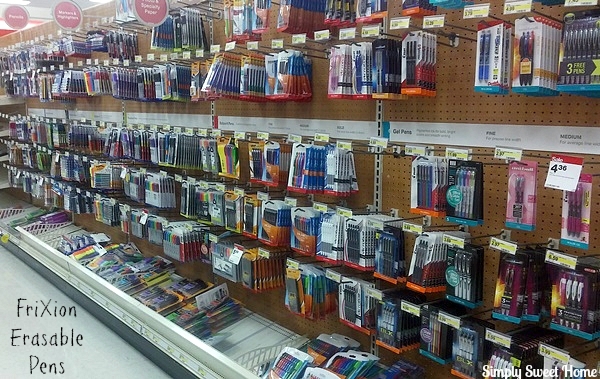 How do you help them erase the stress of school and stay organized? Yes, a lot of these “teen tips” definitely apply to everyone!